Based on the presentation by Finance Minister Pravin Gordhan on 24 February 2016, we have updated our South African Tax Spreadsheet Calculator 2016/ 2017. By using it you will get a sense of whether you will be paying more or less tax next year. Similar to the South African Tax Tables for 2013-2014- spreadsheet calculator,the 2014-2015 version , 2015/ 2016 version, it will allow you to enter your salary and calculate the taxes due. It also allows you to compare your taxes for this year to last year to see the potential impact. When you receive the spreadsheet download, you need to choose your age (for the relevant rebate) and enter your estimated salary for the current year as shown below. For comparison purposes we have left in previous years tax calculations. You can either use the same salary as this year to see like on like impact on your earnings, or put in your actual salaries in those years. Below the inputs you will see the results as shown below. It shows the breakdown by the various tax types, i.e. the fixed portion, the variable portion and the rebate allowed. At the bottom we have shown the effective tax rate and what it means on a monthly basis. Also shown are the previous years and the cells will change colour depending on whether it is good (green) or bad (reddish) for you. 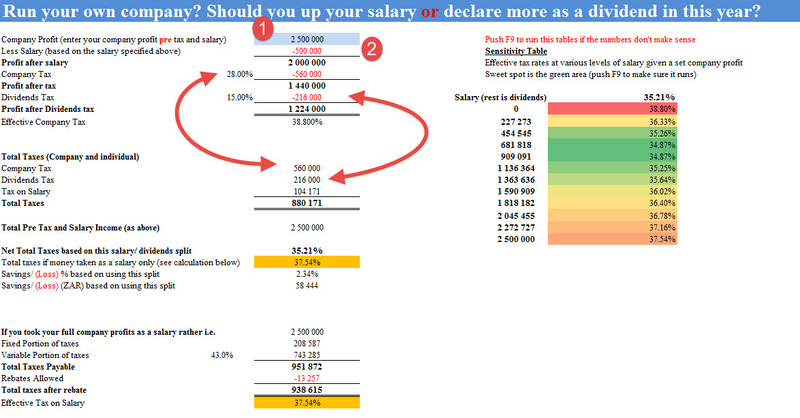 Underneath the salary tax calculations (as per below) is a calculation to determine, where you have a company, what the correct mix of salary and dividends should be to give you the most effective tax rate. You need to enter your company profit excluding your salary (1 below). Your salary is assumed to be the one you capture in the salary portion for the current year (2 below) so you do not need to enter it. The spreadsheet then calculations the company tax and dividends withholding tax you need to pay and combines all three (PAYE, company tax and DWT) to determine your effective tax rate on your company profits. In the adjacent section of the spreadsheet (after you press the F9 key) you will see at what level of salary your salary/ company tax is most efficient.